The finest travel brands in the world have been unveiled at a star-studded gala ceremony in Lisbon, Portugal. 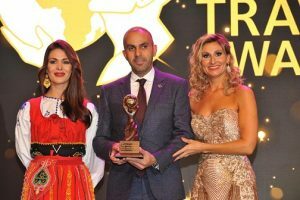 The elite of the travel industry gathered for the World Travel Awards (WTA) Grand Final Gala Ceremony 2018 at the historic Pátio da Galé to find out who amongst them had been crowned the finest in the world. Winners at the red carpet reception included Jamaica, which celebrated a double victory by collecting both ‘World’s Leading Beach Destination’ and ‘World’s Leading Cruise Destination’. The ancient Inca citadel of Machu Picchu, Peru was named ‘World’s Leading Tourist Attraction’, whilst Mauritius fended off stiff competition to emerge as ‘World’s Most Romantic Destination’. The evening marked the climax of the WTA 25th anniversary Grand Tour 2018– an annual search for the finest travel and tourism organisations in the world, with the winners of WTA’s six regional ceremonies going head-to-head for the coveted World titles. Hospitality winners included Armani Hotel Dubai (‘World’s Leading Hotel’); Atlantis the Palm, Dubai (‘World’s Leading Landmark Resort’); Fraser Hospitality (‘World’s Leading Serviced Apartment Brand’); and Four Seasons Hotels & Resorts (‘World’s Leading Resort Brand’). In the aviation sector, Aeroflot capped a year of strong passenger growth by winning both ‘World’s Leading Airline Brand’ and ‘World’s Leading Airline – Business Class’, whilst Singapore Changi Airport was named ‘World’s Leading Airport’ and Muscat International Airport was voted ‘World’s Leading New Airport’. The strength and depth of Portugal’s tourism economy was reflected with victories in a range of categories. Portugal was voted ‘World’s Leading Destination’, Madeira heralded ‘World’s Leading Island Destination’, whilst Turismo de Portugal was named ‘World’s Leading Tourist Board’. Other highlights included awards for Hong Kong (‘World’s Leading Business Travel Destination’), Cape Town (‘World’s Leading Festival & Event Destination’), Guayaquil (‘World’s Leading City Tourist Board’), Europcar (‘World’s Leading Green Transport Solution Company’ and ‘World’s Leading Car Rental Company Website’), Norwegian Cruise Line (‘World’s Leading Cruise Line’) and YAS Waterworld (‘World’s Leading Water Park’). Hundreds of the leading travel industries figureheads from across the globe attended the ceremony at Pátio da Galé, Lisbon’s landmark events and entertainment venue.